Red blood cells when mature, do not contain a nucleus. Neither do they contain ribosomes, mitochondria or other organelles typical of most body cells. Instead the primary component of each red blood cell is the red pigment haemoglobin which is critical to its primary function. Erythrocytes are shaped like an ice hockey puck but with a concave depression on each circular surface. to pick up and transport to the cells the life sustaining gas molecule oxygen, while at the same time removing the poisonous waste product of the cell metabolism carbon dioxide. In a human body the surface area of the red blood cells combined is similar to that of a football pitch. This is the total area available to the blood for the exchange of gases. Red blood cells vastly outnumber other formed elements eg platelets and white blood cells. The shape of the erythrocyte can change as they are forced through blood capillaries smaller than their diameter. This constant shearing and bursting strain makes their ability to transform shape an important survival feature. This is the process of red blood cell formation. it takes about 4 days and begins in the bone marrow. It has requirements for vitamin B12, Iron, amino acids, cobalt and copper. The kidneys play a key role in the feedback loop that regulates the amount of RBC’s being produced. If the amount of oxygen reaching the tissues decreases, the kidneys secrete a hormone called erythropoietin which stimulates the bone marrow to produce more RBC’s therefore increasing the ability of the blood to carry more oxygen to it’s tissues. Red blood cells have a lifespan of between 105 – 120 days. They are so vast in numbers that an efficient way of breaking them down when they become ‘worn out’ is required. Macrophage cells are found in the lining of the blood vessels (especially in the liver and the spleen). Here haemoglobin is broken down into amino acids, iron and bilirubin. Iron is saved and sent back to the bone marrow for re-use. Bilirubin is excreted by the liver in the bile and the amino acids are used to provide energy for the building of new proteins. In each RBC there are 200-300 million molecules of haemoglobin. Haemoglobin is actually a series of 4 protein chains. Each has a molecule of ‘haeme‘ called the haeme group. Haeme contains a red pigment which gives blood its colour. Each haeme molecule contains one iron molecule so there are four iron molecules per haemoglobin molecule. It is these molecules of iron that combine with oxygen from the inhaled air between the alvioli and capillary walls. Each haemoglobin molecule can combine 4 iron molecules with 4 oxygen molecules to form oxyhaemaglobin. this is how the vast majority of oxygen travels in the blood. Around 20% will combine with haemoglobin to form carbaminohaemoglobin. In this case it is the globin chain that combines with the carbon dioxide. 70% combines with an enzyme, carbonic anhydrase which converts C02 and water into carbonic acid (H2CO3). These molecules then disassociate in the presence of water into bicarbonate ions (HCO3) and a H+ hydrogen ion. This reaction takes place very quickly as more CO2 enters the plasma; as a result carbonic acid concentrations will increase and produce further bicarbonate. Therefore CO2 molecules diffusing in the plasma are almost automatically converted into bicarbonate ions. This reduces the concentration of CO2 meaning that more can diffuse into the blood cell. Because CO2 is incorporated chemically in the newly formed bicarbonate ions – it can be transported in the blood plasma until it is exhaled from the lungs. The bicarbonate ion that is made in the red blood cells will diffuse out of the cell into the blood plasma. As the bicarbonate is a negatively charged ion (HCO3-); another negatively charged ion chloride (Cl-) will move into the cell to replace it and maintain the charge – this is called the chloride shift. When bicarbonate ions are made, so too are hydrogen ions. This increases acidity in the blood. Blood needs to be slightly alkaline (requiring a pH of 7.38 – 7.41) so the increase in acidity stimulates faster and deeper respiration, which means that more carbon dioxide is eliminated, reducing the levels of carbonic acid and hydrogen ions which alkalises the blood again. 10% is carried in blood plasma to give blood its partial pressure. The exchange of CO2 and oxygen takes place between the alveolar air in the lungs and the blood in the capillaries: both gases move both ways across the respiratory membranes. The mechanisms depend on the law of concentration and pressure gradients. Fluids and gases will always move from a high concentration, be it pressure or molecular concentration to a lower concentration until an equilibrium is reached. The diaphragm contracts downwards. 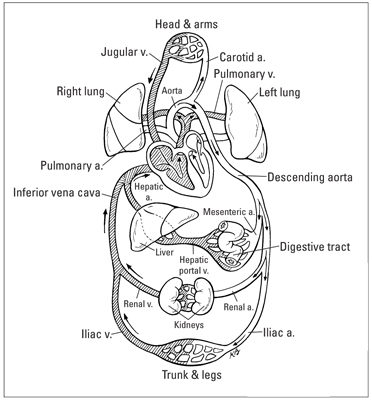 due to the attachment of the pleural linings, pulls down the lungs. The external muscles of the ribs also contract and cause the ribcage to be lifted and thus expand in all directions. As the volume expands, the pressure decreases from 760mmHg (mercury) to 757mmHg. It is this decrease in pressure that causes the outside air to rush in and down the trachea into the alveolar sacs until the two pressures reach an equilibrium as a result of the increased space being filled by the air. Due to laws of partial pressure we can see how the blood coming into the lungs has already offloaded most of its oxygen to cells and tissues, so it is largely de-oxygenated. There is only a partial pressure offered by oxygen in this largely oxygen depleted blood. the pressure exerted by this deoxygenated blood is far less than that of the air of the alveolus; so oxygen naturally rushes across the two membranes into the plasma of the blood. Once there it diffuses down another concentration gradient into the RBC’s to join with haemoglobin to form oxyhaemoglobin and continue its travels. Carbon Dioxide follows the same rules as carbon dioxide except that the pressure gradient is smaller. neutrophils – defend cells by destroying small pathogenic microorganisms. lymphocytes – defend the body by secreting antibodies and as such are very involved in the immune response. monocytes – can enter the tissue and play a powerful defence role as they can ingest bacteria, cellular debris and cancer cells. These are formed in the bone marrow, lungs and to a lesser extent the spleen. they perform a function called haemostasis. That is they can stop the flow of blood. Platelets are able to become sticky and can form a plug to prevent haemorrhage. They also secrete chemicals such as fatty acids (arachadonic acid), thromboxone and adenosine diphosphate at the site of an injury. These chemicals help to reduce blood flow – preventing blood loss. Platelets require the presence of vitamin K and calcium in the blood in order to go through the various chemical pathways needed for them to clot. Atherosclerosis (plaque forming on the artery wall) or immobility and inactivity may also lead to the production of less helpful blood clots (thrombosis) which can cause a heart attack or stroke. Aspirin is often given to prevent blood clots, but the presence of omega 3’s will have the same effect because it inhibits the production of Arachadonic acid, so naturally helps to prevent clotting. The difference between an antigen and an antibody. Antigen; is a substance that when introduced into the body, causes the formation of antibodies against it. Antibody; a substance produced by the body which destroys or inactivates a specific substance (antigen) that has entered the body. Should ‘invaders’ be detected they will cause the blood to agglutinate. When we talk about blood groups, what we are actually referring to is the type of antigen bound to the surface of the RBC membranes. It is crucial in blood transfusions not to mix antigens and antibodies – that is give someone blood plasma which contains the antibodies that can react to the RBC antigen. Because blood type O does not contain either antigen (A or B) it should be safe to give to any other blood group. (There can be issues with type O negative).